If you know me, you know that I love this series. There are almost forty books published so far, and I have read every single one of them. I was recently inspired to re-read Naked in Death, the first in the series, when I convinced Becky @ Escapism Through Books to give it a try. Eve and Roarke are two of the most compelling characters I have come across. You will fall in love with Roarke, no doubt about it. I dare you to find anybody more romantic, ruthless, gorgeous, charming and tortured than he is. They both come to have so much depth as you get to know them, they feel like real people. When you spend so much time in their world (35+ books worth), how can they not feel like real people you’ve gotten to know? The same goes with the other regular characters in the series. I adore everyone. When you are first introduced to the characters in this book, you are just scraping the surface of the things you will learn about them as time goes on. 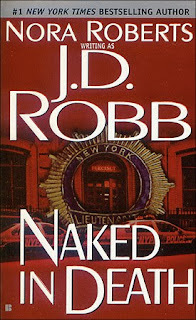 However, from the very beginning, Eve and Roarke should both fascinate you. The futuristic part of the series is also very cool. So many things are different, yet enough things stay the same that it really does just feel like our world advanced a few decades. As you are introduced to different laws, gadgets and ways of living, the series becomes even more fun and exciting to read. I love this aspect of the books. The mystery/suspense part of the series isn’t lacking either. There are always enough twists and turns to keep you guessing. In this book, the murder of Sharon DeBlass is the first in what proves to be a case that keeps Eve and her co-workers on their toes. Roarke’s involvement in it only makes Eve’s position even more precarious and the story even more tense. I cannot recommend Naked in Death by J.D. Robb enough. Romance, mystery and suspense all in a futuristic setting: there is something for everyone. I dare you not to get addicted to the series. Excellent review! Wow, you have a lot of dedication. I really love the early books in the series, but does it feel like the recent cases are losing steam to you ?